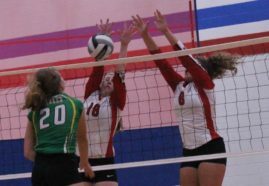 The Brodhead Cardinals volleyball team opened 2017 with a bang going 9-2 at the Cougar-Viking Invite last Friday and Saturday. Brodhead went a perfect 6-0 on Friday. The Cardinals beat Baraboo (25-18, 28-26), Delavan (25-17, 25-12) and Sauk Prairie (25-15, 25-19) in two set sweeps. Brodhead knocked off Edgerton (25-17, 18-25, 15-10), Janesville Parker (25-20, 18-25, 16-14) and conference rival Big Foot Chiefs in three sets.